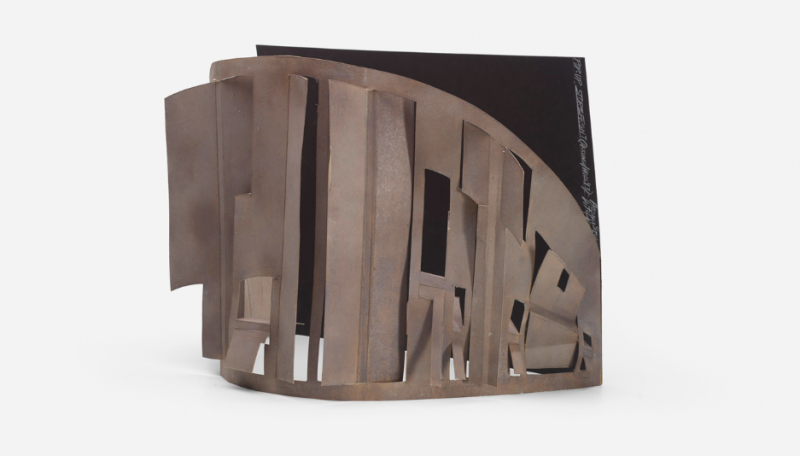 Wright offers a rich catalogue that will stretch over two days, consisting of more than 500 lots with estimates ranging from 100 - 10,000 dollars: a great opportunity for aspiring collectors, design enthusiasts and bargain hunters alike. One of the first pieces to be auctioned off is this Pop-Up storefront created by Vito Acconci: an Italian-American artist, known for his important role in the performance art scene of the 1960-70s. Vito Acconci, Pop-up Storefront. Photo: Wright. The work in question is an architectural design created in 2012 for the company Storefront for Art & Architecture and was featured in the exhibition Aesthetic/Anesthetic the same year. In 1992, Acconci, together with the architect Steven Holl renovated the ageing facade of Storefront’s gallery in New York, a design that created a continuum between the gallery and the urban street that surrounds it. Dining Table by Osvaldo Borsani. Photo: Wright. Next up is this dining table designed by Osvaldo Borsani, the award-winning Italian-Swiss architect and designer. Borsani, more in vogue than ever, is being honored this summer at the Milan Triennale. 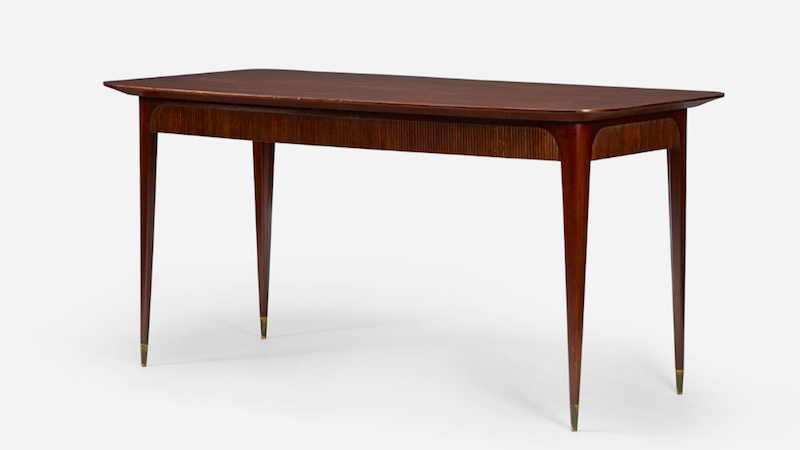 The table is made in walnut with brass trimmings and was created around 1950. The estimate for this brilliant piece is 2000-3000 dollars. Brutalist Cabinet, circa 1975. Photo: Wright. 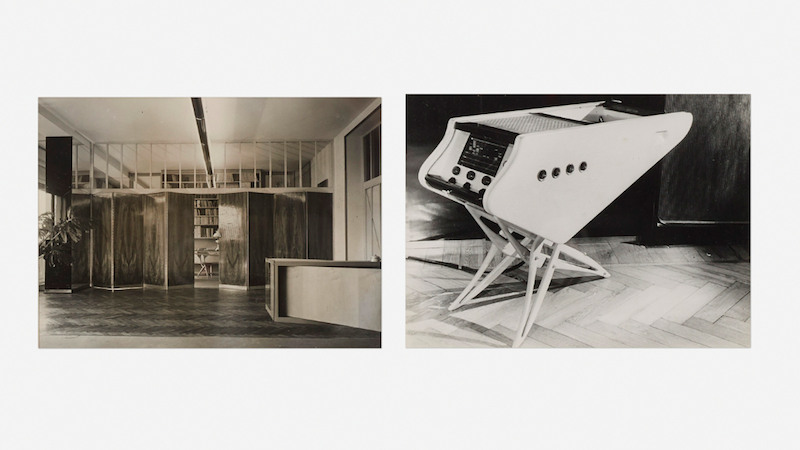 Three brutalist pieces of the 1960’s will also go under the hammer on the auction’s first day. Brutalism was an architectural movement that takes it name from a quote by Le Corbusier and the French word for “raw”, “brut”. The brutalist design has never shied away from rough materials and is not afraid of the structural aspects of a building, such as concrete beams and metal pipes. 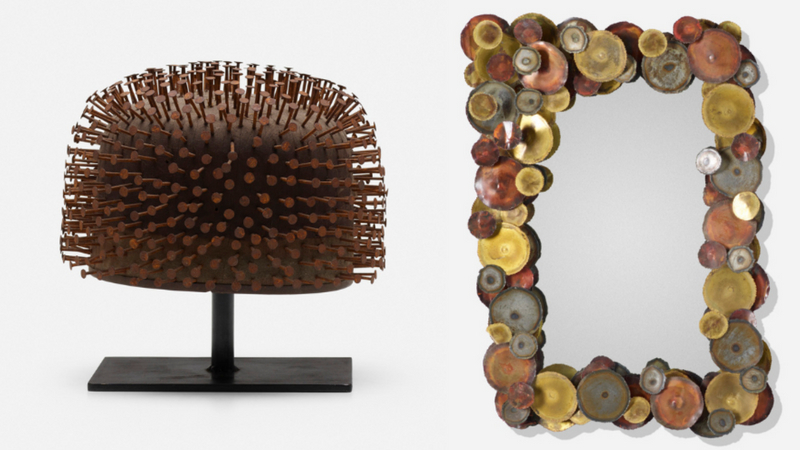 Left: Sculpture made in wood and nails, France, 1970's. Right: Mirror, France, 1970's. Photos: Wright. The Brutalist movement also influenced the design scene, which was reflected in the 50’s, 60’s and 70’s furniture designs. With linear essentials made of raw materials such as steel and wood, the unpolished movement has been making a strong comeback in the last few years. The first day of Wright’s Mass Modern auction will also feature pieces by Joe Colombo, Charles and Ray Eames, Le Corbusier and Arne Jacobsen. Vico Magistretti, Gaudi Chair for Artemide, 1970. Photo: Wright. Wright’s second day begins with a chair created by Vico Magistretti, an Italian designer, a contemporary with Gio Ponti and Piero Portaluppi. In fact, Magistretti, Ponti and Portaluppi were all classmates at the University Politecnico di Milano. 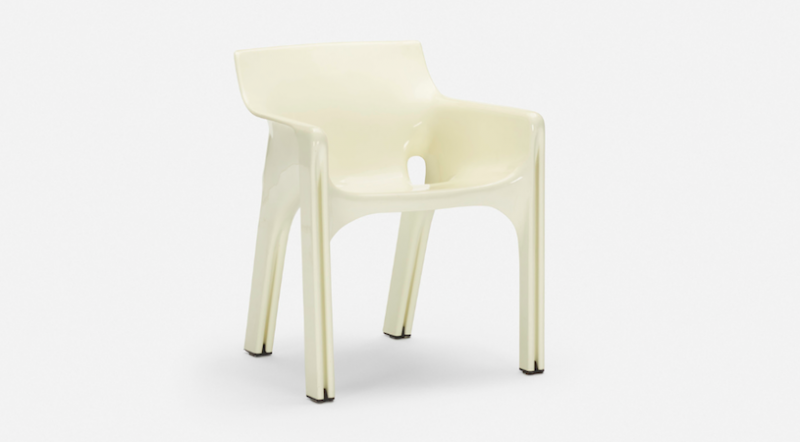 For several years, Magistretti collaborated with the manufacturer Artemide, creating modern plastic chairs that would travel the world and be exhibited in some of the world’s most important design museums. One of the pieces stemming from this collaboration was the Gaudi Chair, designed in 1970. The chair featured at Wright has an estimate of 700-900 dollars. Four cushions, "Barcelona". Photo: Wright. We’ll stay in the modernist era with the help of the Brno Chair, designed by Mies Van Der Rohe for the famous Tugendhat House. The chair has been celebrated for its simplicity, and its design is based on a former chair made by Van Der Rohe, the Barcelona Chair. 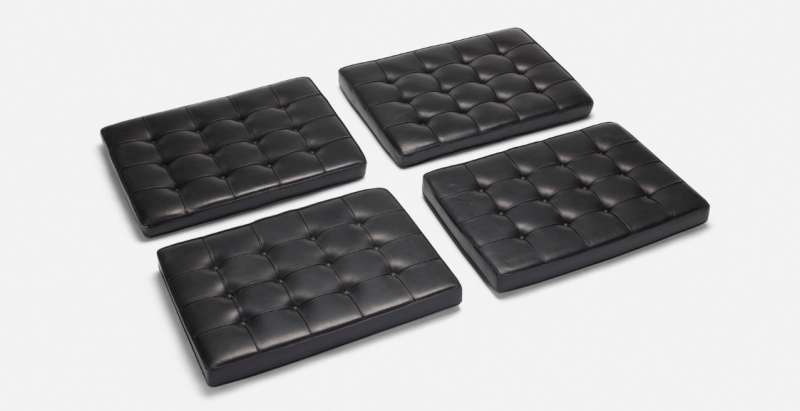 A set of four Barcelona cushions, made for the German Pavilion of 1929, will also be auctioned off on the auction’s second day. The winner of numerous design awards, designer and co-editor of Domus magazine Marco Zanuso will be represented with three lots. These pieces of furniture were all made in 1951 for Arflex during Zanoso’s collaboration with the German designer Richard Supper. The two designers established their partnership in 1957 and worked together for 20 years. Interested in Marco Zanuso? Find out more about his life works here! Marco Zanuso, sofa for Arflex, 1951. Photo: Wright. The Italian Carlo Mollino is a true Jack of all Trades, talented in architecture, design and photography. Mollino stands out from the austerity of modernism and creates unique pieces that draw inspiration from all of the designer’s passions: aviation, motoring and the female body. On Wrights second day of sale, three photographs taken by Mollino will be up for grabs. Carlo Mollino, Without title (two works), 1944. Photo: Wright. 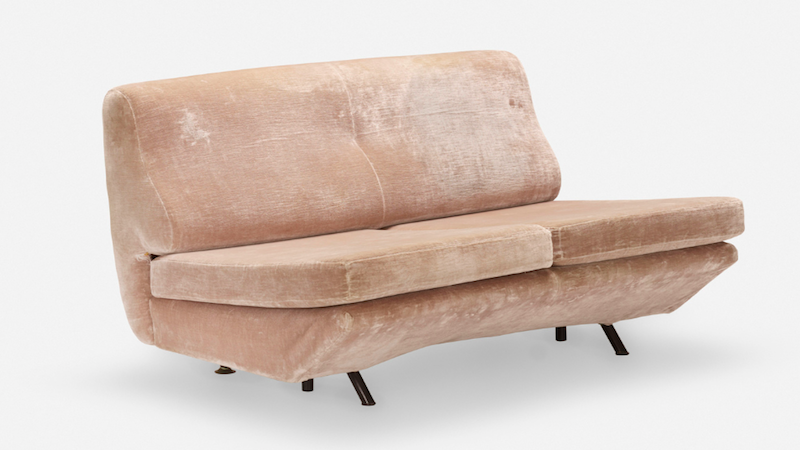 Amongst the auction’s closing lots, we will find a selection of chaise longues by Richard Shultz, some Ettore Sottsass pieces as well as two iconic stools by Sori Yanagi, one of the most important Japanese designers post World War II. Wright’s Mass Modern auction will take place on August 9-10: discover the entire catalogue directly on Barnebys!